A regional magistrate in Bellville, Cape Town, Saba has acted at the Land Claims Commission and both the Western and Eastern Cape High Courts. She has a B.Juris, LLB and LLM from Unisa. During a 2011 stint acting at the Western Cape High Court, Saba overturned a three year prison term after the applicant had pleaded guilty to drunk driving. Saba, with Western Cape Judge President John Hlophe concurring, found the magistrate in the lower court had failed to give the accused’s counsel the opportunity to address the court on the contents of the probation and correctional officer’s reports before imposing sentence. “The constitutional right of the accused to a fair hearing must be real and not illusory. The accused person has a right to a proper and effective hearing,” Saba wrote, holding that as the appellant had already undergone a thirteen week rehabilitation programme, he had “already served his sentence pursuant to the order of the court a quo and therefore, further punishment is unwarranted”. A regional magistrate in Bellville, Cape Town, Saba has acted at the Land Claims Commission and at at the Western Cape High Court (in 2011 and 2012) and Eastern Cape High Court (in 2013). 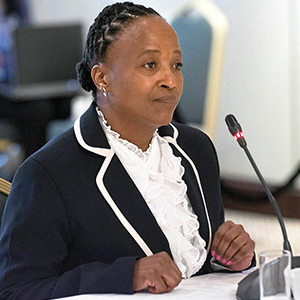 Commenting in why she had acted for only a month in the Eastern Cape division, Saba said “budgetary constraints” had prevented “people from outside the Eastern Cape” from being invited to act in that division. She has a B.Juris, LLB and LLM from Unisa.